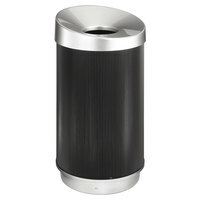 We offer attractive commercial trash receptacles that will blend into any decor or color theme. You can find a decorative metal trash can made out of steel, plastic, fiberglass, and even recycled metal and plastic in neutral black and ivory or bright red, green, and blue shades. From silver step-on cans for medical waste to colorful fiberglass bins with recycling compartments, we have the variety of cans you need to best equip your business. We offer commercial trash receptacles in many sizes, styles, and colors to suit your preferences. Check out our covered cans and ones with dome, funnel, hinged, or open lids to find the best style for guests' convenience. You can also find trash cans that are ADA compliant to make your business more accessible to disabled guests. For additional waste disposal products, make sure you check out our low density garbage bags, high density garbage bags, and biodegradable garbage bags. If you're wondering where to buy safco decorative trash cans, we have a large selection of safco decorative trash cans for sale at the lowest prices.